The term hypermeter is used to refer to groupings within slower pulse streams where a single pulse represents the time taken up by a complete notated measure, and where groups on that level depend heavily on melody supported by harmonic and durational patterns. Depending on the tempo, the note values that represent a whole measure, e.g. the quarter note for 2/4, the dotted half note for 3/4, and the whole note for 4/4, may be easy to hear. 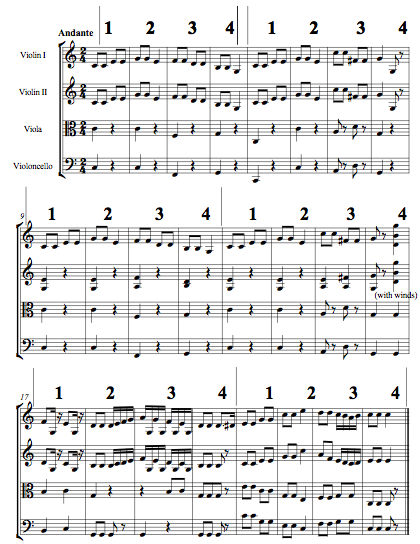 In the excerpt from Haydn’s Surprise Symphony below (Example 55), the numbers show how each measure is counted to form six hypermeasures of four hyperbeats. Each hyperbeat is shown in bold type above the score. If a time signature were to be assigned to represent the hypermeasure it would be 4/2, since each hyperbeat is worth one half note. Using the quadruple conducting pattern, conduct this excerpt to confirm the ease with which these six hypermeasures, each having four hyperbeats, can be heard at the Andante tempo. Ex. 55 Haydn, F.J. Symphony No. 94 in G, ii, measures 1-24. These time spans, equal to four measures, are in fact periodic, but too long to be perceived as such without the intervening lower pulse streams. It is the repeated contours, harmonic structure and note-value patterns that allow us to perceive the first hypermeasure as a cohesive unit, and to sense that each hypermeasure that follows is the same duration. Even though the patterns change in the fifth hypermeter (mm.17-20), the periodicity of the four-measure unit is not disturbed, because the hypermeasures preceding it are all four measures long, and begin with the same melody and therefore there is an expectation that the same length unit will follow. How is variety achieved in the third and fourth hypermeters? Hypermeter is, however, much more susceptible to disruption, and the clear periodicity of hypermetric groups as represented in the Haydn example often breaks down. This disruption is not to be thought of as detrimental or in any way a weakness in the long-span phrase rhythm. In fact, it has been a fertile resource for composers, providing a great variety of expression, drama, and pacing of ideas. Musical form has most often been described in terms of thematic patterns, their succession, variation, and recurrence, as well as harmonic patterns operating within phrases and over longer spans of time. Recognizing the inherent relationship between meter and melody, we can also begin to understand musical form as a rhythmic process. Examine the pieces listed below, all of which are based on four-measure units. Not all of them retain this rhythm throughout. But the ease with which the slow pulse of the phrase can be sensed makes departure from the four-bar unit all the more effective.